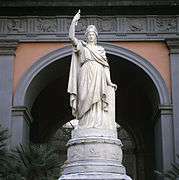 Statue of Italia Turrita in Reggio Calabria. Italia Turrita (pronounced [iˈtaːlja turˈriːta]) is the national personification or allegory of Italy, characterised by a mural crown (hence turrita or "with towers" in Italian) typical of Italian civic heraldry of Medieval communal origin. In broader terms, the crown symbolizes its mostly urban history. She often holds in her hands a bunch of corn ears (a symbol of fertility and reference to the agrarian economy); during the fascist era, she held a bundle of the lictors. Italy’s first allegory – a laurel-crowned female head – appears on the coins coined during the Social War between the Roman Republic and several other cities of Central Italy from 91 to 88 BC. Under the emperor Augustus, an allegorical representation of Italy known as Saturnia Tellus was sculpted in marble on Ara Pacis’ external wall (13-9 BC) in Rome. Another allegory of Italy appears on the coins coined during the reign of emperor Nerva in 97 AD. The representation of Italia turrita was proposed under the emperor Trajan, who wanted it to be sculpted on the Trajan’s Arch erected in Benevento in 114-117, and also on one of the two Pluteos called anaglypha, four years later. Afterwards, from 130 AD on, under the emperors Hadrian, Antoninus Pius, Marcus Aurelius, Commodus, Septimius Severus and Caracalla, Roman coins reproduced the allegorical representation of Italy as a dressed and towered woman who sometimes carries a cornucopia. 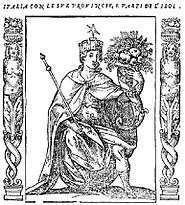 The towered crown is the symbol of Civitas romana, therefore the allegory shows the sovereignty of the Italian peninsula as a land of free cities and of Roman citizens to whom a proper right has been granted: the Ius Italicum. This mythographical setting-up of the Italian land became also popular during the Middle Ages. In 1490, Ludovico Sforza, duke of Milan, had an Italia turrita painted on a medallion of the castle in Piazza Ducale, Vigevano. The Caesaris Astrum appeared again in 1574 on the cover of Historiarium de Regno Italiae, a book written by the historian Carlo Sigonio. 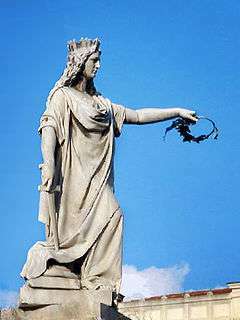 Over her head, a five-pointed star is usually seen shining radiant; an ancient secular symbol of Italy purported to protect the nation, known as Stella d'Italia or Star of Italy. 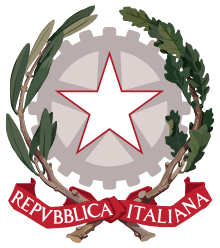 Iconographic of the Risorgimento, it was used as the crest of the armorial bearings of the Kingdom of Italy from 1870 to 1890 and is the dominant element in the modern day emblem of Italy adopted at the birth of the Italian Republic in 1948. 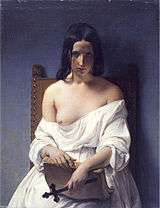 Italia Turrita e Stellata (1861) by Francesco Liberti in Naples. 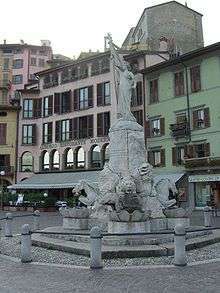 Statue of Italia Turrita in Brescia. 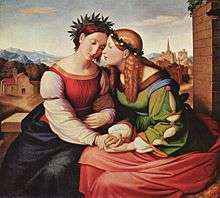 Italia und Germania (1828) by Johann Friedrich Overbeck. Cenotaph of Dante Alighieri (Italia Turrita on the left) in Florence. Statue in Giardini Pubblici Indro Montanelli of Milan. 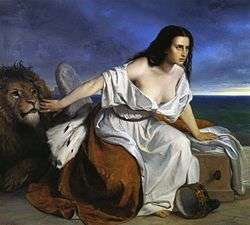 Allegory of Venice (lion) hoping to join Italy (woman) by Andrea Appiani. Mourning Italia Turrita on the Tomb to Count Vittorio Alfieri (1807) by Antonio Canova. Basilica di Santa Croce, Florence. Italia Turrita in Cascina (Pisa). 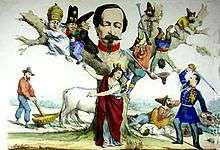 Caricature of the Post-Risorgimento: Italia Turrita at the centre points out to Enrico Cialdini (on the right) all her enemies around Napoleon III (turned into a tree): from the left, Pope Pius IX, Bourbons, clergy, and brigands. In the background, Giuseppe Garibaldi plows up his land in Caprera. Giovanni Lista, La Stella d'Italia, Edizioni Mudima, Milan, 2011.